Whenever I used see the back window of a car covered in dust, it was all I could to hold myself back from writing ‘Wash Me’ on it. Thankfully, there are folks like Texan, Scott Wade, with far more ambition and talent who has made a name for himself as the Dirty Car Artist. Scott uses the dusty back windows of cars as his canvas, creating breathtaking pieces of artwork. You can check out his full gallery of dirty car art here. The Mexico City offices of Leo Burnett recently launched a campaign for Jeep using those same dusty car back windows as advertising billboards. 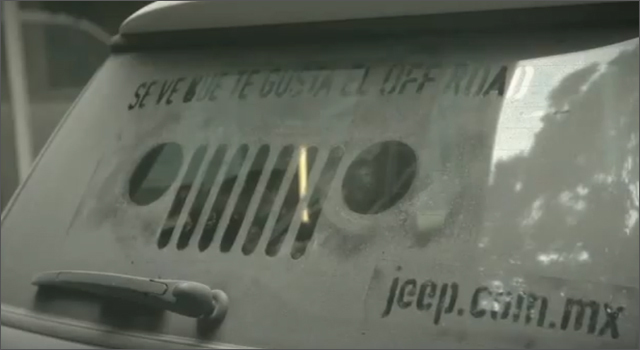 The agency washed a stencil onto the dusty window that read “Se ve fue te gusta el off road” (It looks like it was off the road), and the URL for jeep.com.mx.